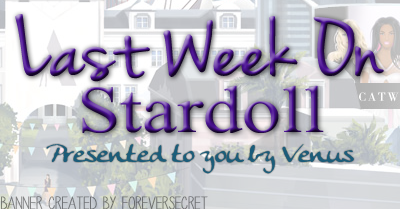 First of all, I want to say I am really happy that we filled Stardoll Thermometer, and got all the final prize. 1 month of extra superstar membership is just what I needed, to save up some money for a new LE, which I guess will come after July the 20th, when is final date to submit your entries for a 'Face of LE' contest. Anyway, other than that, the week was kinda slow, but with some pretty interesting updates. In case you missed something, as usual, you may find it in my recap. Here we go. The week started with another limited store release: Pet-a-porter this time. The collection consists of cute, little, adorable, but let's not forget also limited animals. Not quite usual animals, most of them are wearing some sort of clothes. Which is wrong, in my opinion. I just don't like the idea of dressing pets like humans. My opinion, I repeat. Prices are okay for a limited store, but no matter how adorable the animals are, I just don't want to spend that much money, for a 3 reasons: 1) There are some cute and cheaper animals in Furry Friends store, 2) I prefer cats, and this collection only has a few of them, and 3) I am trying to save up for a Limited Edition store. On Thursday, we got another set of Hair design pieces, this time for a straight hair. Okay, I was the one amongst the some users complaining about Stardoll giving us curly hair pieces, but nothing for straight hair. Even there are much less pieces to use and design your perfect hairstyle, I have seen some really good designs by users, and some USD readers as well. I think Stardoll planned it all along, that's why 'coming soon' sign showed up right upon the release of curtly hair studio. Again, many designers are complaining that there are still only 8 spots for hair designs. Other than that, I like the idea. And by the end of a week, and the last item in my today's recap - a new Pretty'n'Love Decor release. I am not usually a fan of any interior. But having Stardoll app on my phone, I am able to see items better, and I noticed the amount of detail Stardoll puts into every single item, and the uniqueness and creativity behind each of them. I adore the cat with a flower wreath, but other than that, I still don't think I'll be buying anything from the store. I'd prefer if Stardoll released some more racks, mannequins and hangers for clothes, as I like to display my clothes, especially valuable ones that way. So, that was all from this week. The World Cup final is starting soon, and even I don't usually watch sports, I plan on watching this. I don't have a favorite, as the country I rooted for didn't even make it to 2nd round. Anyway, see you next week.